From the Virgin Islands to Alaska, the United States has set aside protected land for 59 national parks in 27 states and two territories. The areas are administered by the National Park Service, an agency created in 1916 as part of the Department of the Interior. Starting with the country’s first national park, Yellowstone National Park, the preservation effort includes glaciers and tropical reefs as well as granite peaks and volcanic lakes. These preserved areas allow visitors to observe wildlife, including endangered species, in their native habitats along with dramatic natural wonders like geysers and lava flows. Some parks even attract extreme sports enthusiasts from around the world to test their level of adventure. Whether you seek the rugged wilderness, canyons and caves or mountains, rivers and the ocean, these U.S. National Parks feature a wide range of geological features and recreational opportunities. You can relax and enjoy the natural beauty or feel the adrenaline rush from extreme sports, all while surrounded by the unique settings of America’s national parks. As the coldest and northernmost national park, Gates of the Arctic encompasses more than 8.4 million pristine acres etched by the forces of nature. The entire park lies north of the Arctic Circle and features endless summer days and aurora-lit winter skies. This premier wilderness landscape does not have any roads or trails. Visitors can observe wild rivers that meander through glacier-carved valleys, caribou following ancient migration trails and an intact ecosystem where native populations have lived in symbiosis with the land for thousands of years. Be prepared with proper clothing and gear if you visit this national park; temperatures can plunge as low as -70 degrees Fahrenheit. While not the coldest, Mount Rainier National Park does rank for the extreme snowfall. This iconic symbol of the state of Washington is the most glaciated peak in the lower 48 states and is the source of six rivers. The park is covered by an average of 680 inches of snow each year. The highest snowfall total of 1,224 inches was recorded in 1972. During the winter, the park is a haven for ice camping, skiing and snowboarding. Meadows of colorful wildflowers and lush ancient forests ring the dormant volcano in the spring. Outdoor enthusiasts can engage in wilderness hiking, camping and rock climbing in the park’s backcountry. In contrast, Death Valley National Park is the hottest park on record with summer temperatures exceeding 130 degrees. Straddling the borders of California and Nevada, the park occupies a portion of land between the Great Basin and the Mojave Desert that is more than 275 feet below sea level. Towering snow-capped peaks border the sun-scorched park during the winter. Despite its name, Death Valley contains lush oases that harbor a diversity of wildlife and rare spring rains coax wildflowers to paint the arid landscape with vivid colors. For visitors looking to pack their trip with adventure, plan hiking, backpacking and four wheeling excursions. Occupying the tallest point in the United States, Denali National Park is the country’s windiest and highest site and commonly experiences winds that exceed 100 miles per hour. Peak gusts on Denali, located in Alaska, have registered at more than 185 mph. The park offers a variety of opportunities for backcountry skiing and remote climbing. Over the years, hundreds of climbers have tested their mountaineering and wilderness prowess against Denali’s 20,310-foot tall peak. 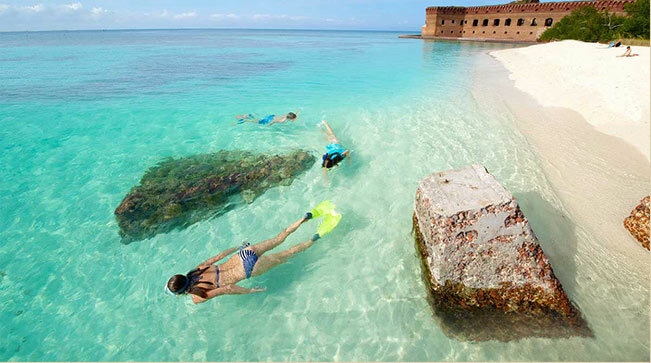 Dry Tortugas National Park is designated as one of the most remote national parks in the United States. 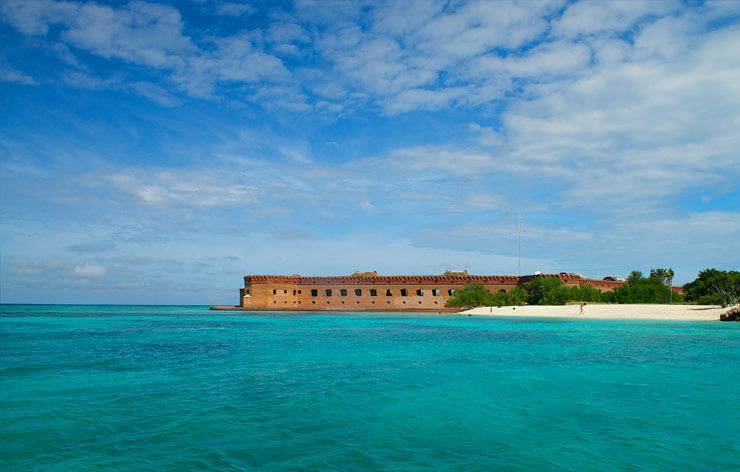 Although it contains a former defensive bastion, Fort Jefferson, which served as home for many prisoners, the islands do not have a source of fresh water. The cluster of seven coral islands is located 70 miles south of Key West. Ponce de Leon, who discovered the islands in 1513, named them for the abundant sea turtle population. It is renowned as the location where Dr. Samuel Mudd was imprisoned for his role in the assassination of President Lincoln. In addition to exploring the remnants of the fort, visitors can camp overnight, swim in the aquamarine waters, snorkel the underwater habitat and kayak in designated areas. Channel Islands National Park encompasses five of the eight Channel Islands off the coast of California. The park is home to a wide range of cultural and natural resources and over 2,000 different species of plants and animals. The islands are on the migration route of the endangered blue whale, a truly unique sight to be seen. Visitors can day hike and camp as well as scuba dive and spearfish in the clear water. An extensive network of spectacular sea caves awaits ocean kayakers. Sand Dunes National Park is one of only a few sandboarding and sandsledding destinations on Earth. In addition to the tallest dunes in North America, the park’s diverse landscape includes wetlands, grasslands, aspen forests and alpine lakes. Splash in Medano Creek or hit the sandy slopes like a futuristic union of Duke Kahanamoku and Lawrence of Arabia. Visitors to this Colorado park can also explore the park by backpacking into the forests, foothills and mountains. Set within California’s towering Sierra Nevada range, Yosemite National Park is famous for giant sequoias as well as the granite cliffs of Half Dome and El Capitan. The park is also a haven for extreme sports enthusiasts. Hang gliding from Glacier Point in Yosemite has a fascinating history dating back to the 1970s. Previously supervised by park rangers, the activity is now coordinated by a private organization. Take the leap and soar over some of the most scenic landscape in the world. Outdoor adventurers looking to experience a white water rafting voyage should head to the Grand Canyon National Park. Trips down the Colorado River are available on motorized or oar-powered boats. There is a mix of tranquil currents and spine-tingling white water. Don’t worry if you’re a new comer, guests have a choice of excursions based on their level of experience. During this adventure of a lifetime, your watercraft will float past canyon walls that soar a mile into the sky. As the name might imply, rock-climbing enthusiasts are drawn to Rocky Mountain National Park. Climbing has been a popular pastime in the area since the 1800s. Presenting challenges that span the gamut from rock and big wall climbing as well as bouldering and mountaineering, the site attracts climbers from around the world. Visitors have a choice of gentle peak routes, mixed alpine courses and long traverses. You can also explore the Colorado wilderness by hiking the backcountry. At more than 13.2 million acres, Wrangell-Saint Elias is the largest national park in the system. Rising from the ocean to the summit of Mount St. Elias, the park encompasses a vast landscape of rivers, valleys and mountain meadows as well as ice fields, glaciers and snow-capped peaks. The national park and preserve, located in Alaska, are home to an abundance of wildlife. Visitors participate in a range of backcountry wilderness activities, including hiking, snowshoeing and camping. The park permits the use of all-terrain vehicles and snow machines. In stark contrast to Wrangell-Saint Elias, Hot Springs National Park is the smallest park at 5,550 acres. Established in 1921, it is one of the oldest parks managed by the National Park Service. The park is designed to preserve the natural hot springs that provide warm water for the bath houses in what became known as “America’s Spa.” Open throughout the year, roads and hiking trails enable visitors to see the springs that emit from the base of the Hot Springs Mountain in Arkansas.